On January 23, a dozen gourmet lovers who also enjoy culinary art and like to share their experiences gathered together at the downtown facilities of Betty’s Kitchen to learn from Michael Rosenblum, Executive Chef of the US Ambassador’s residence, about using cranberries to make the most authentic American, healthy and best tasting muffins. This is part of a cranberry promotion event organized by the Cranberry Marketing Committee. 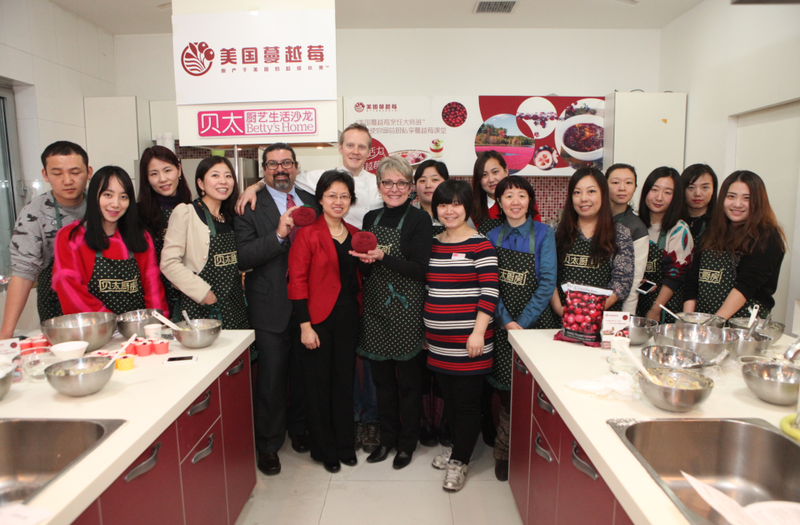 People from all walks of life were invited to submit innovative recipes using cranberries as ingredients to the web-site of Betty’s Kitchen, a partner in this event and supporter of several CMC programs in China. The campaign was a hit as the top banner ad and the rotating banner on the Betty’s Kitchen homepage announcing the competition generated 1,424,724 page views and 51,383 page views respectively while the corresponding click rates were 28,578 and 34,256. The landing page describing the detail rules of the competition generated 113,508 page views. Altogether 125 recipes were received which included cranberry milk pudding, cranberry glutinous rice balls, cranberry meshed potato salad, cranberry egg custard tart and cranberry fruit tea drink etc. 13,256 visitors submitted their votes for their favorite recipes. 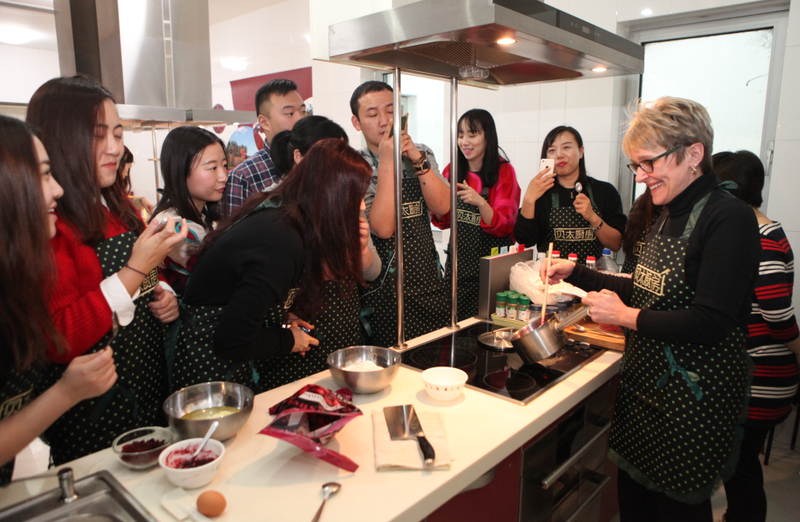 Contestants getting good ratings for their submitted recipes and residing in Beijing were invited to the cooking class (others received complementary gifts). The invitees were all surprised to see Ms Melodee Hanes, wife of US Ambassador to China. Mr. Max Baucus, present herself as special guest. Mr Bruce Zanin, Director of Agricultural Trade Office of the US Embassy made an opening remark. Scott Soares, Executive Director of CMC presented the various nutritional values of cranberries, such as antioxidant and the anti-adhesive attribute which prevents bacteria from attaching to the human stomach wall. Melodee impressed the people around not only with her friendly, approachable personality but also by her love of cooking and her passion for cranberries. She also shared her own secret recipe for making cranberry jam. With Melodee serving as his impromptu assistant, Chef Michael showed the invitees how to prepare the ingredients, step-by-step. His sense of humor made learning a lot of fun. The invitees learnt that cranberries, in addition to their many health benefits, are versatile as ingredient for cooking and have a lovely natural red color that would make the final products look as well as taste good. The 12 invitees all tried their hands with their new knowledge about making cranberry muffins. Their products were compared for their presentation. The best one received from Scott a Crosby (stuffed toy in the shape of a cranberry with a sweet smile) as gift. All invitees also received a recipe book by Chef Michael. It was such an enjoyable event that many wasted no time to post pictures and comments onto their social media pages, spreading the words about cranberries around again.